What Is Involved in Face Lift Recovery? Bruising and swelling are normal parts of the face lift recovery process. The process of face lift recovery can take several months, although the most acute phase of recovery is typically within the first two weeks. During the initial phase of face lift recovery, a person may experience swelling and pain, both of which can be managed through the use of painkillers and cold packs. As face lift recovery progresses, it is important that a patient follow his or her doctor's instructions, particularly with regard to the use of cosmetics as well as over-the-counter painkillers. Some individuals may find that they experience facial numbness for several months after the procedure and may also notice that their appearance undergoes continuous changes during this time. 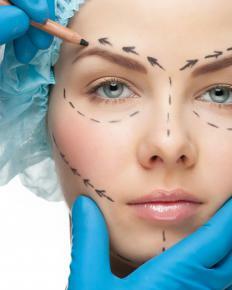 After a person undergoes a facelift, he or she will typically spend at least some time being monitored by medical personnel at the location where he or she had the surgery. Depending on the nature of the surgery and the individual's condition after undergoing the procedure, he or she may be sent home several hours after surgery or may spend time in the hospital. In both cases, he or she will be responsible for assisting in the recovery process by addressing issues of pain and swelling. The patient will typically be instructed to keep his or her head elevated to reduce swelling. He or she will also need the assistance of a caretaker for some time to avoid engaging in any type of strenuous physical activity that might hinder the recovery. The main concern that many people will have during face lift recovery is the bruising and swelling caused by the trauma of surgery. Depending on the patient, these effects may not go away right away, although a patient may be able to use cosmetics to conceal bruising after a week of recovery, provided that he or she has a doctor's permission to do so. The patient may also find that it may take a while for his or her face to both heal and normalize in appearance. Making efforts to follow doctor's orders and avoid things that could retard healing, such as smoking or being in the presence of secondhand smoke, can help speed this healing process. Individuals who are unable or unwilling to assume responsibility for practicing appropriate self-care during face lift recovery may wish to look into alternatives, such as non-surgical face lifts, which do not require incisions or major anesthesia. What Does a Face Lift Surgeon Do? What Are the Pros and Cons of a Second Face Lift? What is a String Face Lift? What are the Different Types of Non-Surgical Face Lifts? What is a One-Hour Face Lift?